A couple of months back I wrote about one of my favourite books – Persuasion by Jane Austen. At the time, fellow blogger Northern Mummy left a comment on my blog telling me about a series of books written by Amanda Grange which tell the Jane Austen stories we all know and love from the perspective of the male protagonists. 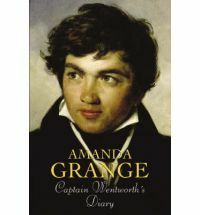 Captain Wentworth’s Diary looks at all the action of Persuasion from Frederick Wentworth’s point-of-view. Of course, I had to go out and hunt this book down! We first meet Frederick as a young man at the start of a stellar career in the British navy. On shore leave he goes to stay with his brother Edward, a curate who lives in a small country village. It is here that Frederick meets a certain Miss Anne Elliot in whom he finds a kindred spirit. This side of the story – how Frederick and Anne meet and fall in love – is something we never hear about in much detail in Persuasion. It is with a rush of guilty pleasure that I read Amanda Grange’s version of events. Ultimately, Frederick proposes and Anne accepts, only to refuse him when persuaded to by her mother’s friend, Lady Russell. Eight years pass … during this time Frederick becomes Captain Wentworth and wins his fortune fighting in the Napoleonic wars. Fate leads him back to the village where he met Anne. There he finds Anne much altered after all these years. They are like strangers now and he has no idea of how she feels to see him again. I won’t give away anything more. It was interesting to read a whole new take on Persuasion. The author did a pretty good job of channeling Jane Austen. I wouldn’t say that this is a literary masterpiece, but it was a nice way to pass my reading time. I’ll have to read this one I think! Have you read: “A Man of Few Words”? by Katherine Woodbury. I found it had a lovely sense of humour from Mr. Darcy’s (yes! THE Mr. Darcy!) point of view. No, I haven’t, Sounds like a good read. Thanks for the recommendation!